Here at the Environment Agency we are committed to tackling waste crime. Not only is it a serious offence with tough penalties, but it can also damage the environment, blight local communities and undermine businesses out there that are operating legally. As an Environmental Crime Officer I’m responsible for protecting the legitimate recycling industry, ensuring the welfare of the environment, safety of the community and bringing illegal operators to justice through the courts. My role is to keep my finger on the pulse and track down sites where waste is being stored or disposed of illegally, using intelligence gathered from a variety of sources – including information from the public and working together with the police and other partners. 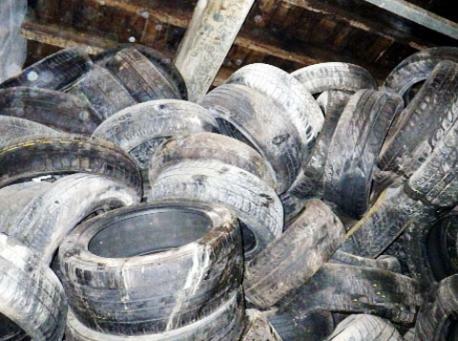 A recent case – where we discovered thousands of tyres illegally stored within the walls of a mill in Burnley – highlights how information from the public, along with partnership work, can make a difference and bring under control a site which had become a serious fire hazard to surrounding residents and businesses. We launched an inspection of Oxford Mill, in Oxford Road, Burnley, after receiving reports that the site, which had become derelict, was suspected of being used to illegally store waste. Upon arriving at the site, we noticed tyres were visible from the road side through a broken window on the top floor of the mill. Once inside, we discovered a false wall had been fitted inside the mill that was concealing nearly 5,000 of tyres. If these tyres were set alight, perhaps through vandalism or by accident, the fire would have been very difficult to put out. It would also have produced a vast range of substances, many of which could harm the environment or human health. It was vital we acted swiftly in the interests of the wider community. Working alongside Burnley Borough Council, Lancashire Fire and Rescue and the mill’s new owner, we were able to make sure the tyres were swiftly and safely disposed of, ensuring the safety of the public in the process. Everyone who disposes of waste has a duty of care to ensure their waste is handled correctly. Whether you are a business, local authority or householder you must make sure you know where your waste goes so it doesn’t end up in the hands of illegal operators. Waste crime officers have an important role investigating illegal waste operations. The nature of their work requires them to maintain anonymity. If you have information about waste crime, call our incident hotline on 0800 80 70 60 or report anonymously to Crimestoppers 0800 555 111. Further information about the Environment Agency's work to tackle waste crime.